They’re huge at home, but cracking the market in the States has required some extra patience and creativity. When Spotify for Artists connects with Arkells singer/guitarist Max Kerman, he’s on his way out of New York City, where, two nights prior, his band headlined a sold-out show at Irving Plaza. For fledgling acts, the iconic, 1,200-capacity venue is a key way station on the path from club-level buzz to theater-filling stardom—the sort of room that makes an artist feel like they’ve arrived. But in the context of the Arkells’ current North American tour, Irving Plaza represents both a career milestone and a demotion. In their native Canada, the Arkells are bona fide rock royalty, with albums that routinely debut in the upper reaches of the domestic Billboard charts and multiple singles that have racked up millions of Spotify streams. A week and a half before that Irving Plaza gig, the band performed for a sold-out crowd of 15,000 at Toronto’s Scotiabank Arena; last summer, they attracted nearly double that amount at a stadium show in their nearby home base of Hamilton, Ontario. They’ve effectively inherited the title of Canada’s most popular rock band from their idols, the now sadly defunct Tragically Hip. When their recent album, Rally Cry, debuted at No. 12 on the Billboard charts last November, it was the only record by an active Canadian rock band in the Top 50. Earlier this month at the Juno Awards (i.e., Canada’s Grammys), they took home the glass statues for Group of the Year and Rock Album of the Year, giving them a total of six career wins. But like the Hip, the Arkells have found that Canadian success isn’t the same thing as North American success—because no matter how many arenas you sell out and how many Junos you win back home, there’s always the nagging question of why that success doesn’t immediately spill over to the same degree in the United States. Kerman is well aware his band’s sound—a fusion of Springsteen rock ‘n’ soul and post-Arcade Fire indie wrapped in a sleek, Top 40-teasing pop package—really has no current corollary on American radio. “In 2019, the slice of the cultural pie that rock has is so much smaller than it’s ever been,” he observes. But five albums into the Arkells’ career, Kerman is still game to crack the U.S. code, one club gig at a time. And while he’s confident in his band’s ability to continually win over new converts with their ecstatic live revue (where the quintet are accompanied by a four-piece horn section, a trio of backing singers, and, depending on the stage, pyro and confetti), the Arkells have also employed some novel strategies to promote Rally Cry in the U.S. From a truckstop in upstate New York, Kerman outlines his band’s strategy for America. Spotify for Artists: You just sold out Irving Plaza in New York. How did you lay the groundwork for that moment? Max Kerman: We’ve been going to New York for a while. The first gig we played there was at [tiny Lower East Side club] Pianos. We did the Knitting Factory in Brooklyn, we’ve done the Rough Trade record store, we’ve opened for Frank Turner at the Beacon Theatre… The thing about America is you can tour a new city every day of the year. So for us, it’s about concentrating our efforts. Sure, we could do a tour of the Midwest and play Sioux Falls, but we found it helpful to be like, “Okay, here are the 20 markets that we’re going to be mindful of and make sure we’re hitting once a year.” There’s generally a correlation between the amount of times we’ve been to a place and how many people show up the next time. And I think that says something about our live show: People spread the word. In the absence of a big crossover hit, how are people in America finding out about the Arkells? Let’s talk about some of the creative ways you’ve promoted your new album in America. 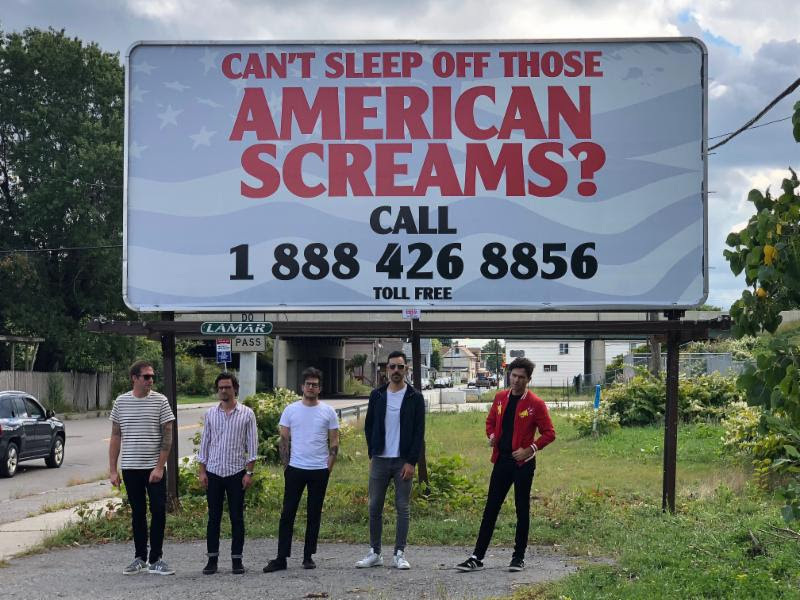 Our single “American Screams” has a lyric about billboards on the highway, so we thought, “Maybe we should make a billboard on the side of a highway in America and set up a 1-800 number where people can call and listen to the song!” I remember hearing some stat that there are like 3,000 to 5,000 new songs put out every day. The trick, as creative people and small-business owners, is: How do you put your best foot forward and make sure the song gets heard? So we thought that combining something in the physical world with something that could also easily be shared online would be an interesting way to do that. All the ideas come from us—it’s not like we hired a consulting firm to dream up some marketing scheme. And I personally don’t feel that [marketing] part of the job is a burden—I think of it as another creative exercise in its own way. You also played some pop-up shows in New York. We did a little thing at Sid Gold’s Request Room, which is a classic-looking piano bar right around the corner from Madison Square Garden. I think a big part of our band’s appeal is the communal quality of the music, and feeling like it’s not just a band up there—it’s everybody bringing their best spirit to the event. A lot of our songs were written on the piano or acoustic guitar, and at the end of the day, I just love a good ol’ fashioned singsong, where everyone’s a little drunk. One time, we did a show at Laurier University in Waterloo [Ontario], and I noticed they had a public piano outside in the courtyard, and we were playing in the gym, and after our last song, I said, “Everyone meet us outside at the piano in five minutes for the encore,” and we did [Bruce Springsteen’s] “Dancing in the Dark.” That stuff plays well on the internet. We did a thing for the radio station in Calgary where we played on an LRT train, and it was the best. Of all the things we’ve put on Instagram recently, that thing got by far the most reaction. You grew up as a fan of The Tragically Hip, a massively successful Canadian band who always seemed to be on the brink of breaking into America. As someone who’s now in a similar position, how important is it to you to achieve that? It’s funny, because the Hip were not an anomaly. If you go to the UK and look at the festival bills, it’s like, “I don’t recognize 85 percent of this lineup.” Every country has bands that the locals love that don’t necessarily cross over into every country. To assume every band ought to have the crossover success of The Killers or Arcade Fire or U2 is totally unreasonable. It’s important for everybody to recognize the amount of bands that are popular in every single country is actually so small. There are versions of the Hip in the UK, and bands that are big in America but can’t do [much] in Germany or Australia. When I realized that, it made me feel better. We just try to do what we can do, and be as inventive and thoughtful [as possible] when it comes to our live show and making our records.